Hakodate Shacho no Yoku Nomu Beer is a 10% barley wine from Hakodate Beer, located in the southern peninsula of Hokkaido. The name roughly translates to “The beer the company president often drinks” though at 10%, I can’t really imagine him drinking too much of this if the state of drinkers after a work party is anything to go by. Drunken revellers stumbling out onto the streets after a few Kirin would not be able to hand a sip of this. A 10% beer that the president often drinks? How often does he make it to work the next day on time? Hakodate Shacho no Yoku Nomu Beer didn’t come with much indication of what kind of beer it was on the label, though at 10%, the choices were easily narrowed down. Even when Hakodate Shacho no Yoku Nomu Beer poured out, it belied its style of being a barley wine as it was pretty lively, even managing to produce some semblance of a head, not something barley wines are well known for. The aroma though was potent – strong caramel and figs with a large amount of alcohol aroma coming off too. It almost smelt like it had gone off, but how could that be possible with such a young barley wine? After checking out the side of the bottle, which did say drink within three months, rather than say FIVE YEARS, alarm bells went ringing. The alcohol was such a strong feature to Hakodate Shacho no Yoku Nomu Beer that the body of raisins and figs couldn’t hide the alcohol and made it unpleasant to drink. The harsh taint to the palate almost made me want to throw this beer out, yet every sip I had (and you will sip this beer) made me one more step closer to being drunk. 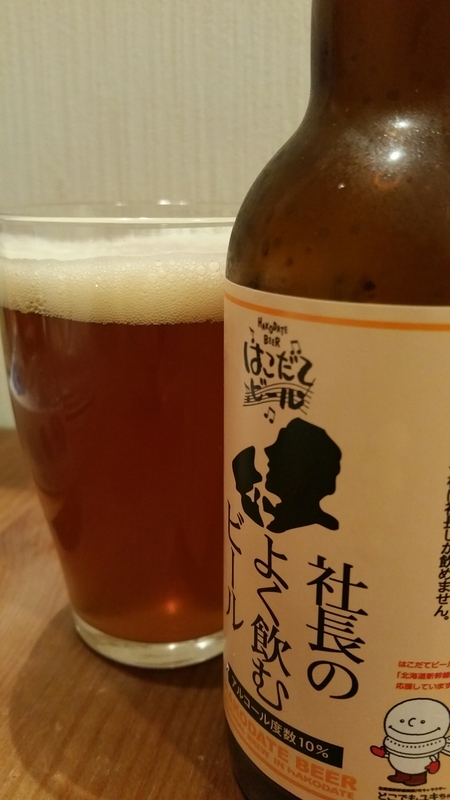 Hakodate Shacho no Yoku Nomu Beer is a pretty poor barley wine that I would not like to drink again. How the hell does the president drink this so often?! Hakodate Shacho no Yoku Nomu Beer is a seasonal beer but we picked our bottle up from Isetan in Kyoto station. It can also be bought on the Hakodate Beer store on Rakuten here if you wish to destroy your insides. sonow they call it a barleywine? this is available all year, or it used to be. been on tap a few times these last few years but as a strong ale. it used to be darker coloured, too. everybody changes everything, sigh. it used to be their best beer.